Sometimes I feel like its all a dream. Like I'll wake up and it will have just been a horrible nightmare that I won't have to remember for more than a day. I keep wishing that real life was like a Lifetime movie, where you are shown the consequences of a choice and then go back and can make a change. I feel like if we had known just a sliver of what we know now about her disease just a month earlier than we did, we could have changed something. I know I shouldn't get stuck in the what ifs, but its so hard. If she had never been clear, if we had never heard NED, I think it wouldn't be as heart wrenching. I feel like we missed our chance; like we had our open door and we let it shut in front of us. This is the feeling that haunts me. This is what made the holidays so hard. I can't let this happen to another family. I have to start getting this information together to help other families. We need to get parent advocates in every hospital for every disease - someone who has been there and can help sort through the information right at the beginning. Someone who can help by sharing the information that is out there and point that family in a direction that is right for them and their child. Doctors need to be more forthcoming in the information that they share with patients, and not pussyfoot around issues that are "hard" to talk about. They also need to be willing to work with other doctors and hospitals to design care plans that are more individualized for their patients, and less "cookie cutter." Some diseases, like Hodgkin's, have a tendency to do the same thing most of the time, but Neuroblastoma is not one of those diseases. If we don't share individual experiences with others, there is no way that each doctor will see the many mutations and courses that this disease can take. Rather than competing for patients, consortiums and oncology groups need to work with each other to tailor treatments for the patients they see, using all the resources available, not just the ones at their hospital. Here is my example. Recently, I spoke to a woman from Connecticut who also lost her little girl to this horrible disease at the beginning of December. I was glad to talk to her, as I felt like I needed to share my feelings with someone going through the same things. Sadly, her story is almost identical to Saoirse's, and towards the end, they experienced very similar, inaccurate "symptom management" from their doctors. While Saoirse's doctors were telling us that her disease was not looking like anything they had seen Neuroblastoma do before, there was a little girl in CT who had just lost her battle in the exact same course of events just weeks before. Now, you may say that there is no way that this could have been put out to the world of doctors in time to save Saoirse, or to even help in her treatment in any way, but I challenge the fact in the advent of social media and the internet. If particularly difficult and abnormal cases were presented on something like a Facebook group for NB doctors, there could have been a connection made as soon as a post was read. There might be a benefit to the fact that only 600 - 700 kids a year are diagnosed with this disease - social networking would not take all the time of a doctor or advocate to sift through the individual situations. And if parents gave the early symptoms that they experienced with their child, pediatricians could more easily find and learn what to look for in their patients and do the early testing (yes, there is a URINE test for NB!) that might help to diagnose these kids earlier and give them a much better chance at survival. With all the advancements in cancer treatment over the last 40 years, it is sad that more and more kids seem to be diagnosed each year. We should find out more about these kids and how they are developing these diseases, and work to find the answer to why they get a disease and other kids don't. I'm not happy with the "we don't know the cause" answer so readily given out by doctors. There has to be something, and with all the technology out there today, I think we should be able to figure out what in our environment is making these kids develop this evil inside of them. I, for one, am going to be throwing away our cleaning chemicals, and starting to eat organic and less processed. That's my rant for the day. I suppose I have found a direction for some of my frustrations, and now i'll have a place to direct my efforts. It's wonderful to see that you want to be proactive and that you are turning your tragedy into a triumph for NB patients and families. You and Mike can't change the world on your own but through your blogs there can be an army ready to help you change it. And we can all start by simply making people aware of NB. Best of luck to you and I wish you much success in your fight. I think you're onto something Kezia. Something like the international database that OneMatch (bone marrow/platelet donation registry) has set up. It will be a long road for you to push for this--Dr's/researchers/hospitals/facilities all have egos, secrecy to protect what each is working on, competition for dollars and prestige etc--keeping them from working together. But, if you (with many helping you) can get there, it would have the power to change things. Save a little life, extend a life, increase the quality of life, lead to breakthrough's in treatment and early detection. And with the technology that is available today, it really is so simple. And you mention the urine tests....I know that long studies were done in Japan, Germany and Quebec, but that was so long ago. There hasn't been much that I have found on anyone trying to develop a more accurate urine test and run a study on that. Maybe there is though....again, a database of information could be the key to everything for NB. INFORMATION!! Information for Doctors, researchers, advocates, parents. Without information, and SHARING the information, we are powerless. You and Mike did all that you could, especially considering the 'storm' you were in, and the overwhelming breadth of information. And when you heard NED, you were able to just be a family, be happy, celebrate without being all stressed--that was important for Saoirse. And you. Now, tragic as it is, everything leads you to where you are supposed to be, and 'what-if's can be put to work--as long as you don't let yourself get lost in them. I wish it hadn't of been this way, but maybe Saoirse was SO, so, special because she was meant to help you change the future for hundreds of children and families. And wake others up to this so that they can help. In her honor. You're a great Mom Kezia and I know you can find a way. And others, like I, will help with the work however you need. I agree with Audra's comments. Also. I know Julie mentioned doing a change.org petition (on your facebook page) - we were chatting on there about what the petition should ask for - I think there are some very important things in your post that could be included on that petition. We were taking about getting more info and some drafts done and emailing it to you to see what you think. well, Im THAT MOM FROM CT, and I can't tell everyone enough how inspiring Kezia is to me. I am so broken right now, and I know she is too, but she is digging down so deep and she keeps going, regardless...Kezia you are amazing, I am so glad to have been able to speak to you, sad to share this experience, but like you say "there is a reason behind all of this"
Kezia, I cant wait to talk to you again! THIS IS YOUR CALLING! YOU CAN MAKE IT HAPPEN!!!!! "If particularly difficult and abnormal cases were presented on something like a Facebook group for NB doctors, there could have been a connection made as soon as a post was read." Continue to be strong and fight for others! Check out rockstarronan.com it's an incredibly heartbreaking account of a mother with a 4 year old and their battle with neuroblastoma. It is also now about her life after losing her son a few months ago. It's tragic and she is doing incredible things trying to change the way this disease is handled and seems to have many of the same frustrations. You two should connect and change the world! There is actually a national network for pediatric cancers and treatment designs that every hospital/ doctor is expected to follow. This is much more regulated for pediatric cancers than adults since there are so few of them. Early detection is only good if it's specific for bad disease and you can do something about them. The urine screening in Japan and Canada was stopped because it did not work, too many babies were subject to chemo unnecessarily as many times neuroblastoma goes away naturally. 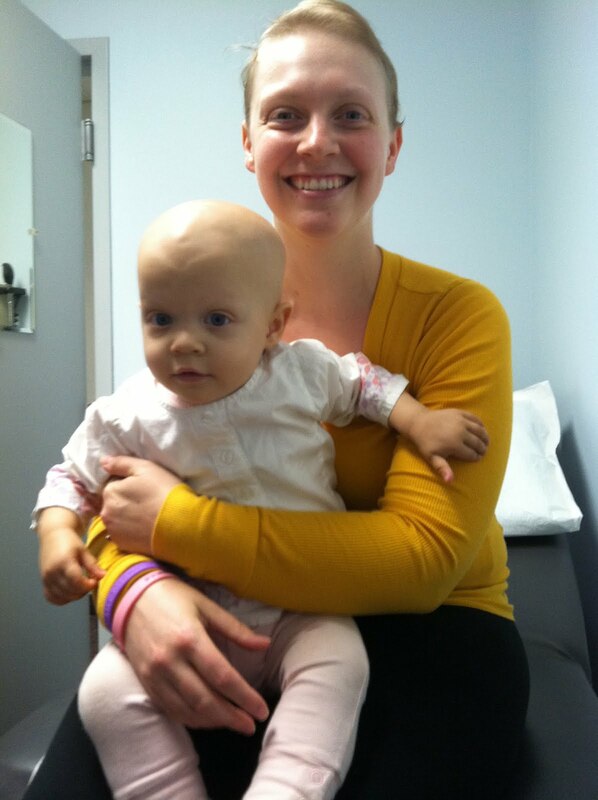 Almost 40% of all babies have neuroblastoma at the time of birth, but most go away. The trick is to identify the ones that will not. There is certainly a need for more research and improved treatment of this disease as its one of the worst pediatric tumors. The incidence of tumors of the nerves system has been going up both in adults and kids. Environmental chemical, radiation exposure from all sorts of devices potentially even including wireless networks and flying could all play a role. It's hard to prove. I do not want to believe that your doctors did not know the course of the disease and symptoms as its fairly typical of neuroblastoma although liver metastasis is not too common. I think they just knew that nothing curative could be done. It's sad and frustrating, this is why I do not practice medicine, I could not bare the anger and guilt associated with the loss of a life, especially that of a child. You can do a lot, Susan Komen and Evelyn Lauder have shown this in breast cancer. It's the most honorable and full filing way to continue to support your daughter. I've been thinking and I know that one of the things that really needs to be done is that people need to be more aware of NB and also more aware that there are deficiencies in the availability of information for patients, families, and doctors. One way that this can be done is obviously through interviews and telling your story. Now I know that you have told your story locally and on CNN but what about if you possibly contacted the magazine Women's World? They often run stories with a message, like yours is, and they are more than willing to add information on how to help. Plus it offers a different audience than the one from CNN. I know it may be too soon but i just thought that I'd suggest it since it's a way to raise awareness and to present your ideas for a better way to get information about NB and make the best decisions for our kids. Plus it's a very large audience and the more people involved the better the chances of success. Kenzia...you mention a urine test but another poster mentioned they aren't very accurate for infants. Do you know if they are accurate after a certain point? Are there other tests that could or should be mandated? These are examples of things "we" can petition. Thoughts? Darlene -- I am so very sorry about your little girl as well. I really feel for you and any parent that loses a child. Take Care. Keep talking. Of drugs used and who to enroll on clinical trials right away. Immunotherapy and differentiation therapy timing could also make a difference. Most importantly there is a need for better drugs and there was just one recently discovered that inhibits MYC, the gene that's amplified in bad neuroblastomas like Saoirse had. I think this will be tested soon in NB,, as it already shown improved survival in other bad tumors. So there has to be a change and drug companies have to pay more attention to pediatric cancers despite that it is a "small" market. This is where parents could potentially help. Good morning! I live in Texas and stayed up last night reading both of your blogs. I heart breaks for both of you! I have 2 little ones and cannot phantom what you must be going through. I will keep your family in my prayers. There is an organization in Cypress, tx called Layla Grace Children's Cancer Research Foundation. The Marsh’s also lost their baby girl to Neuroblastoma last year. They are doing everything in their power to get the word out about the HORRIABLE childhood cancer. Hoping yall will be able to help each other in some way. We're sorry for the passing of your sweet daughter. We've followed your story since it appeared on CNN. My heart goes out to you and your family. No words can provide comfort at this time. Take one day at a time. Our daughter, Sophia Grace Martinez, 5, of Tucson passed away on Thanksgiving Day from a rare form of ovarian cancer. Her battle lasted just four months. Her cancer had never been seen before by any of our doctors and they struggled to come up with a treatment plan. We are heartbroken. I wish you peace in the years ahead. My condolences to the loss of your precious daughter. I do agree that all doctors should work collaboratively for any kind of illnesses, etc. As a matter of fact, they all need to work with all over the world, not only United States. I also read that it is possible that doctors are keeping secrets and not want to share with their patients relate to some kind of illnesses. For instance, some food or other things than a specific medicine, etc will probably help with a cure for any illness. Well, I think money is the reason. Supposedly, a food or a herb will help to cure an illness, then they will lose their business or a help from them is not needed. Of course, some medicine, etc from doctors are needed for any specific illness, but not all of them. Some food will help preventing cancer, etc. Of course, something in our environment is causing it, and also our genetic may play in part of it. You mentioned about using non chemical products, etc. I thought this may help you all with choosing which products to use that don't have any chemicals that may cause cancer. Parabens is one of them, many people are avoid it, me too. Meanwhile, I always send prayers and healing thoughts to you all and other families/people as well. HMMM...this is a good argument for a National Health Plan Information Network (i.e.. Medical Records Database). Have you ever tried to read medical records? Illegible. Praying for you and sharing your stories. That's is all I can do. Much love to you and yours. SweetiePunk, there are many simple tests for many kinds of cancers that are minimally invasive and inexpensive. However, these tests are often very vulnerable to temporary influences, such as what the person ate that day or if they happen to have a cold. They can only indicate that further testing may need to be done. When a high risk population or correlation/causation of certain types of cancers are identified, then it is logical to test the people who have the likeliest risk. The problem with Neuroblastoma is that there are no "high risk" populations. Researchers aren't even sure that what falls under the NB umbrella are even the same diseases. That is why they are seeing such a variation in the way that the disease responds to treatment. When they researched giving the VMA (urine) test to general populations, they found that it produced false positives for some of the kids and missed cancers in the other kids. Doctors do not have a hidden agenda to withhold promising treatments from their patients, especially pediatric cancer patients. I have heard doctors say the same things that Kezia is saying "We have NEVER seen Neuroblastoma do this before." More research is desperately needed! We parents are so desperate for a cure! Please, anyone who reads this blog and that of Saoirse's father, please help us advocate for more neuroblastoma research. Breast cancer accounts for 20% of all cancers, yet makes up 40% of all cancer research funding. My daughter is 4 years old and already has had most of her close friends die from cancer. I am only holding out the hope that every day that she is alive with no visible cancer means every day closer to a CURE. I agree whole heartedly with what you've said here. Although our baby was only dealing with Acid Reflux disease we also found that doctors didn't seem to be communicating with one another. In order to manage our daughter's pain we had to be the ones doing the research on the latest treatments/safe doses of medications. We found many parents with children undergoing the same thing as our daughter ended up with their child on feeding tubes and with surgeries that may not have been needed if they had just had the right dose of medication to control the pain and reduce feeding aversions. We also found out we were living in a toxic black mold infested environment no help from the many doctors and specialists she had seen for unexplainable breathing problems. It's like doctors tune out and don't really listen to what is being said ... we even had doctors refuse to do a chest x ray at our request ... and then once the toxic black mold test came up positive and the x ray was done she had damage that would have shown up on x ray months previous ! We take our children to doctors thinking that they will help us ... it seems there should be something that can be done to enhance this experience for future parents !! My Alexander was diagnosied at 8 months old - so he "should" have been fine and done very well. But his tumor just didn't respond the way it "should" have and he had many other problems. I know that people are working on more individualized treatments, but it is just so hard when so "few" kids get this kind of STUPID CANCER every year. Of course when you kid is one of the "few" it doesn't matter to you. Keep taking it one day at a time - and do what you can when you can! Please do not be angry at yourself. You can be angry at neuroblastoma, cancer, mutant genes like NMYC that made Saoirse's tumor so bad, but do not blame yourself for not doing something right. You did everything a parent could have and should have done. It is increadibly painful to loose a child, but feeling responsible for it and feeling that you failed her makes this even worse.Sadly some tumors are not curable at this time. She had one of those. Never fully responded to treatment, progressed very fast, spread everywhere in her tiny body. She was too sick to be eligible for experimental trials and even that most likely would not have helped. We need more knowledge and better drugs and treatment based on this. I have run into this problem Kezia - Doctors do not communicate well and research enough. It's like patients have become numbers. Maybe there are just too many patients and Doctors don't have the time... not sure. But I lost my Grandmother last year because of a Doctor's inability to diagnose and treat her symptoms...I finally had to get on the internet and start researching myself. Had I done this sooner, my sweet Grandmother most likely would be here today. I feel your pain...and it is completely normal for you to ponder the "what ifs". I have been following your blog for about six months or so, I have read most of your past posts before that six months. I check in every month or so to see what is going on..I am so sorry to hear about your lose. I can't even put into words how I am feeling and I have never met or talked to you or anyone in your family. I can't imagine what you and your husband are going through. I am a 22 year old who lives in southern California. I lost my mom in 2009 after a long & exhausting four year battle with breast cancer, I have also witnessed the ups and the downs that comes with cancer. Nothing like yours I imagine but in a sense cancer is cancer. Your last post was had a lot of what if's, i think this is a normal part of grieving. I did the same thing for about a year after my mom’s death..if only, I should have done this, I should have pushed harder. But now, two years later I can honestly say that feeling will pass and you will be at ease with the terrible outcome of this tragedy. I just want to wish you and your husband the very best in these troubling times. May your little angel rest in peace and I hope one day your mind will be at peace with all of this. Anyway, I keep blabbing on...I just wanted to let you know that I applaud you for the way you have handled everything thrown your way. You are a strong woman and an inspiration to myself.